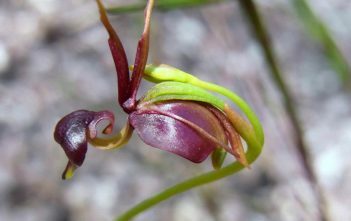 You are at:Home»Archive for "Caleana"
Caleana, commonly known as the Duck Orchid, is a genus of orchids from the Orchidoideae subfamily native to Australia. The genus Caleana was named after George Caley, an early botanical collector. Caleana major is the only species in the genus. Two other species (C. minor and C. nigrita) formerly included in this genus are now regarded as members of a different genus, Paracaleana.